Tacos are a favorite around here. Who doesn’t love the combination of well-seasoned grass-fed beef mixed with toppings of your choice, even without the traditional shell? A quick search will reveal all the creative recipes we’ve made around the idea of tacos. Instead of a sweet potato shell like a one of our popular recipes, this recipe turns the regular avocado accompaniment into a shell. This makes them ideal for lunch or a snack. 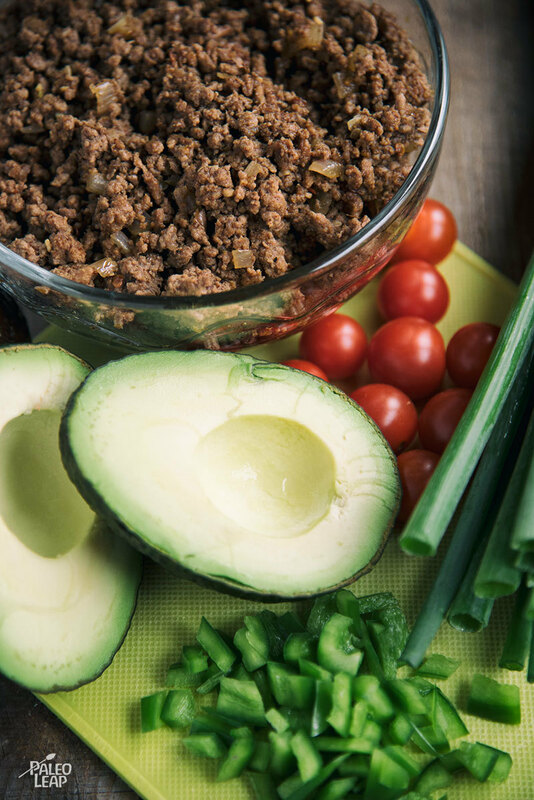 You won’t feel overly full from carbs, instead, you’ll be satisfied from the healthy fats and nutrients from the avocado and beef. Because the avocado cavity is pretty small, keeping the toppings to a minimum is probably your best bet. Leave those for a salad or cauliflower tortillas. The verdict is still out on cooked avocados. Some people refuse to try them and others really enjoy them, even if a popular Paleo breakfast option is egg baked in an avocado. If you’re totally against eating warm avocado, then this exact recipe may not be for you. You could always skip warming the avocado, but then you may want to cook the bell peppers with the meat since you won’t be using the oven. In a bowl combine, chili powder, paprika, garlic, onion, oregano, cumin, sea salt, and black pepper. Melt cooking fat in a skillet, over high heat, add the onion, and the ground beef. Cook until the beef is browned, sprinkle with the spices, and cook stirring until well mixed. Place halved avocado on a baking dish. 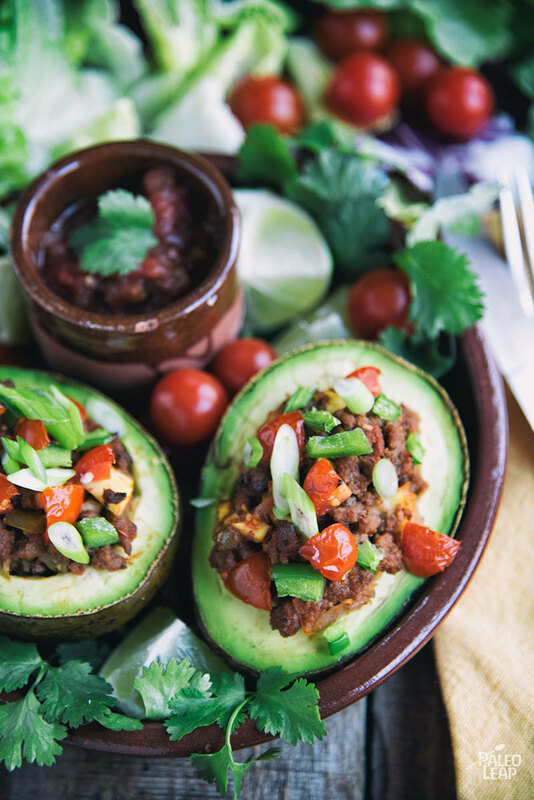 Fill each avocado with ground beef, and top with bell pepper, and tomatoes. Place the stuffed avocado in the oven and bake for about 10 minutes. Serve the avocado topped with green onions, and fresh homemade salsa.